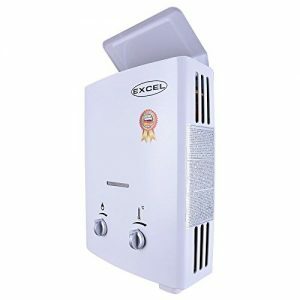 Perhaps the most critical feature of this heater is the fact that it can work without a pressurized pump, which makes it easy to adapt to any circumstances and to use in any environment. It starts with as little as 2 PSI of water pressure, but it can go as high as 120 PSI. Other similar models usually require a pressurized pump to start, or if they don’t, they need at least 20 or 30 PSI, but not this one. This uses new technology to deliver better results. Aside from this beneficial aspect, the technology used also manages to help the device save energy in the process. The customers that have tried this product have complained that the main problem is the fact that the safety start is very touchy, meaning any slight air bubbles will automatically kill the flame, which can significantly slow down the process of heating the water. This safety measure should not be disregarded, however, because it’s the way that the manufacturer provides in order to make sure that no unexpected accidents occur while using this model. You might also encounter trouble with leaks over the course of time. This model works on propane gas and can function without the use of a pressurized pump, which is a significant advantage. It’s portable, so it’s ideal for RV trips, and you can easily mount it outside. Most importantly, its vent-free technology doesn’t require any expensive flue. The installation process also isn’t very complicated. You only need to hook up the gas line, two water lines, one for hot and one for cold water and put the batteries inside and this product is ready to be used. It is however recommended that the water that enters the device shouldn’t be any more than 40F and that only if you reduce water flow rate. It is equipped with an oxygen depletion sensor which helps keep the system safe even in case of long hot showers when several issues might occur in the case of a regular portable heater. What you need to make sure of is that the water vent is not directly under the water lines, because the item gets hot when it’s being used, and this might be the cause of certain malfunctions. 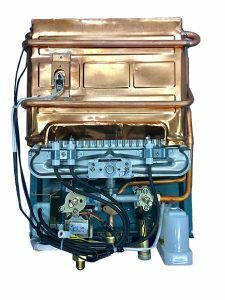 Also regarding safety, we need to mention the safety start, which will automatically stop the process of heating the water inside if it detects anything unusual and give you time to fix the issue. Aside from using this heater when you’re traveling in your RV, it’s an excellent choice for a wide range of outdoor spaces, from cabins to boats, mobile homes or even some indoor alternatives such as flats. You can easily install it almost anywhere using a few hoses and connectors. But the most important thing is that wherever you choose to place it, you will have unlimited access to hot water whenever you want to, given that this item instantly delivers it when you open the tap.